This was not an ordinary Friday night. I had the pleasure of trying out a new product called BLAZE fig balsamic glaze. My cheese man (yes, I own a man made of cheese) Paul, sells this great ham from Emilia Romagna called Prosciutto Cotta. It is a wonderful tasting ham with fresh rosemary throughout. I can't resist buying it when he gets it in. I sliced a crusty baguette, spread a tiny bit of grainy mustard, then a slice of ham, a sliver or Piave Vecchio (or Parmigiana Reggiano) and half of a dried fig. 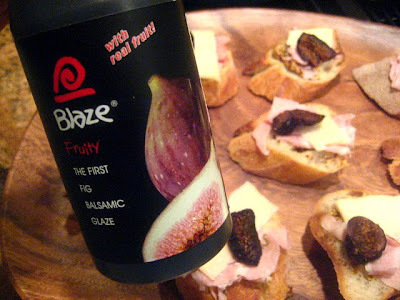 Drizzle with the Blaze fig balsamic. Let sit out one hour before serving, and you have an easy, fantastic crostini! 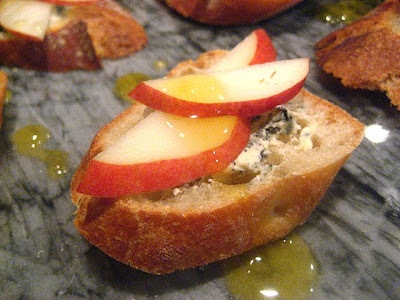 I also bought a St. Agur blue cheese from France, and spread it on the rest of the bread slices. Put some thinly sliced pears on top and drizzled honey over the platter. Wait an hour before serving. Cheese tastes best when it comes to room temperature. 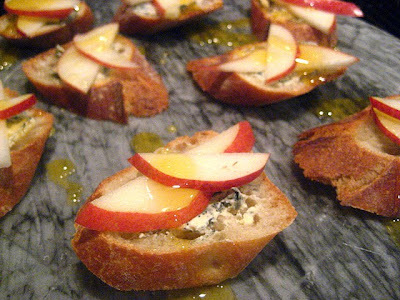 Serve with a nice red wine and you have a party! Stacey, you are becoming Italian. 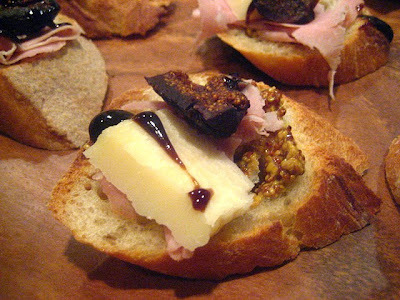 Prosciutto cotto is so delicate and delicious, but not that easy to find. I have to get some of that fig glaze! It looks fabulous. Mmmmnn! I love cheese nights. Can I borrow your cheese man? We have a great Italian store a few towns over. Haha!! A guy I know intimately bought that glaze recently because of the name!! hasnt used it yet, and does not know what he will use it on!! I will pass this on !! and he will find a use for his Blaze!! Glaze!!! Perfect with a glass of wine! These sound wonderful. I bet that would be great on a pork tenderloin! Your bruschetta looks wonderful. Where is this cheese guy you speak of? Fig balsamic glaze? I want some! I will hunt it down. I've had the prosciutto. It's great. The glaze is new to me, but I've already ordered some. Thanks for these two. 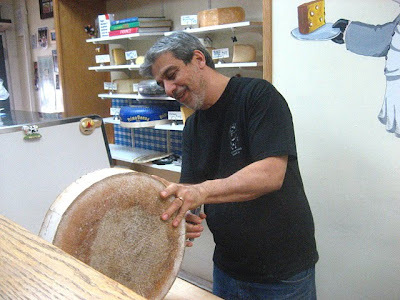 Your very own cheese man! I'm envious! And that balsamic glaze looks fantastic. I want to come to cheese night at your house! You always manage to come up with such wonderful idea Stacey. Not sure if I can get this balsamic here. Will try to look harder. I'm jealous. I don't have a cheese man. The fig glaze sounds fantastic with the cheese! Never in my wildest thoughts did I ever think of this idea! I love how my recipe turned out - thanks for posting this recipe here!